It’s officially summer and we’ve been busy with trail work and adventures! This past weekend we joined The Oregon Timber Trail’s Swift Campout on Waucoma Ridge. A group 6-strong assembled at Upper Green Point Reservoir, which is about 45 minutes Southwest of Hood River. With temps in Portland forecasted to be in the high 90s, the idea of pedaling a short trail to camp at a lake at 4000 feet seemed like a fine idea. We rolled out past weekenders on motorcycles and families car camping at the Reservoir on Larch Mountain Road, which took us to Rainy Lake Trail - an overgrown old trail that follows the Wahtum Aqueduct. We took our time on trail, getting whipped by new growth and flowering bushes, we stopped to filter water, we cheered each other on at the one good stream crossing. Eventually we found ourselves at Rainy Lake, but decided to descend and camp at Black Lake. After a nice fellow hiker who had already scouted the scene showed us a nice site with a dense canopy of trees overhead. We set up tents, snacked and prepared camp. We had no agenda for the day, so we settled in, chatted, took naps, and made food. I don’t regret to tell you we didn’t do much else. It’s not that the trip to the campground took all that much effort, I think we had all been doing a lot in the weeks leading up to this campout, so we were all happy to have some chill out time. Russ, who had car troubles and was unable to roll out with us rolled into camp later in the afternoon. The next day we woke early and planned our ride along Waucoma Ridge towards Wahtum Lake. None of us knew what to expect. This area had been under snow until recently. We rolled out at 9:45 on the gravel road from Black Lake to Rainy Lake. We stashed our camping gear at Rainy Lake and started our trek uphill on Wahtum Lake Road. It wasn’t long before the trail narrowed, got rockier and steeper. At one point the trail became a streambed and we did our best navigating the wet rocks. The trail didn’t seem like it had been cleared recently and we had to deal with a good deal of blow-down, every time dismounting and finding a way over the trees blocking our ascent. 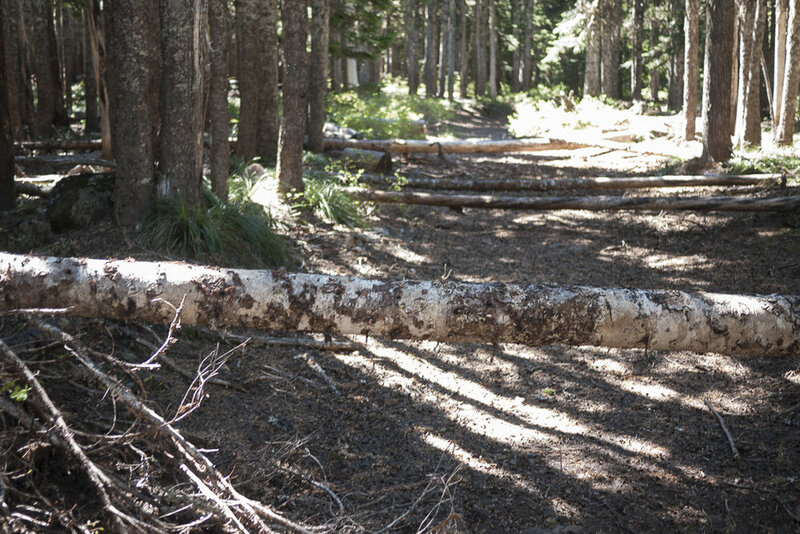 We soon realized how much time and effort downed trees add to a trip. Even though we had stashed camping gear, we still had bikes loaded with food and water. Eventually we topped out, made our way past more downed trees, rolled over several small patches of snow and started the descent to Wahtum. At some point, though we realized we were making slow progress and if we were going to make our meet up time, we needed to flip it, knowing how technical the climb had been, knowing how many downed trees we’d have to climb over on the return of our out-and-back route. We weren’t sad not reaching Wahtum. We had enjoyed the process, we had helped each other on a challenging trail. Russ had gotten to ride his fat bike over snow. We vowed to return with chainsaws. We had a range of experience on this ride, but everyone taught each other. We returned to Rainy Lake where we swam, ate lunch and waited for Gabe and Hannah to roll up from Black Lake. Eventually our group reconvened and we decided to take the gravel road back instead of redoing the overgrown trail. We figured we already knew what that experience was like. It wasn't long before the sound of motos reminded us that we were returning to the reservoir and the land of SUV's stuffed with coolers. One more dip in the lake (with excellent views of the Cloudcap side of Hood) before heading back down into the heat. I learned I need to bring more food and how to chill out a bit. Next time, I’ll bring the chocolate. Promise. 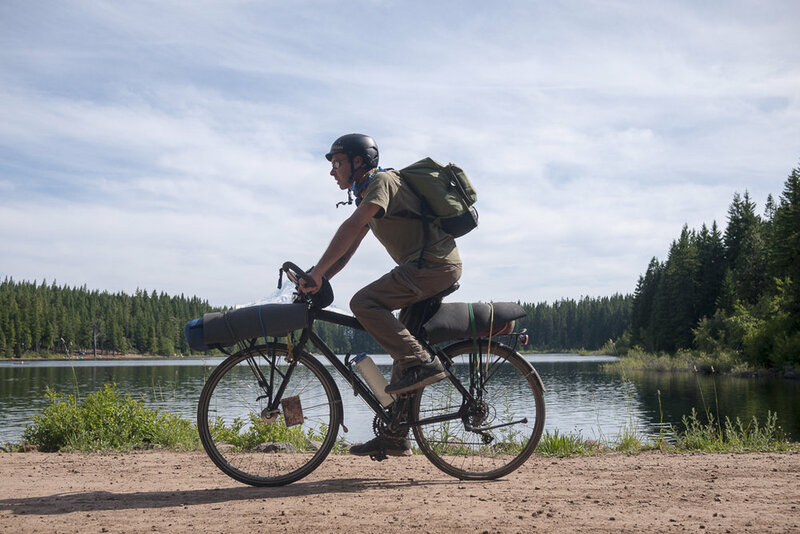 Read more about what conservation group BARK has in mind (partnering with recreation groups like NWTA, Oregon Timber Trail, Mazamas to create an bikepacking friendly trail network) for the Waucoma Ridge.